My Christmas tree is finally finished. I took it out to ‘rest’ just after Thanksgiving, and we began decorating it that weekend (it took one evening just to open my ornaments) but then we all got busy, and so it sat, lonely, half finished, and half forgotten, in the dining room window. Tonight though, I coaxed our temporary housemate into helping me with the outside lights. Then, after I bribed him with homemade chili and homemade chocolate chip cookies and cocoa, we finished the tree. The ornaments spun on their strings, slow pirouettes slowing into stillness that could be broken with the hint of a breath. The green of the plastic tree began to take on a healthier color. The glass pieces – birds, fish, fruit and vegetables – glittered and glistened in the soft glow of the white tree lights. The last hook was attached to a branch. The last plastic icicle given it’s place, the center of a triangle of three lights. “It’s always been a Christmas tree,” he said. 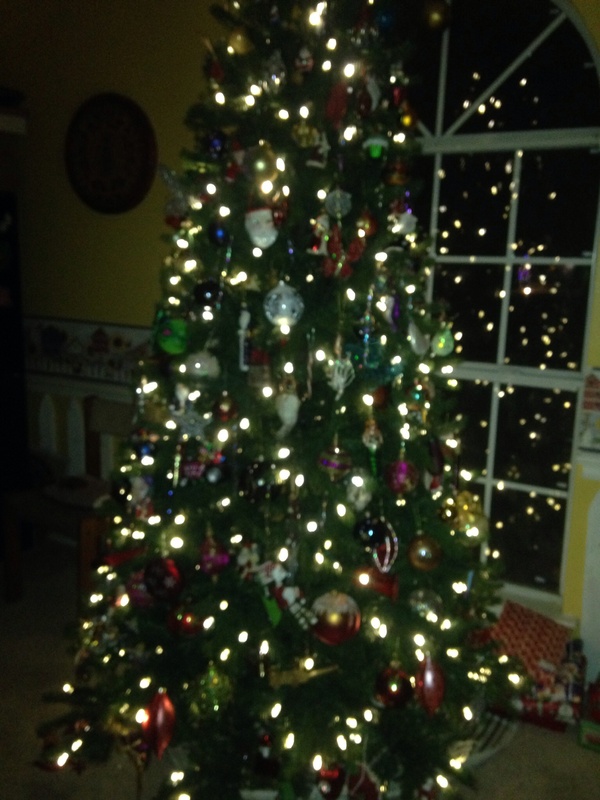 The memories danced in my mind as the decorations shone on the tree, and I texted my husband to tell him it was done. He sent a smilie and the three words that matter most: I love you. Holidailies Splashes	Christmas treedecoratingHolidailiesHolidailies 2013tradition.